Anchored by the Roebling Bridge and the RiverCenter towers, this part of Covington features the Northern Kentucky Convention Center, two hotels, restaurants, offices and the riverfront. It also has some amazing public art and iconic architecture. Public Art The statues and murals of the Riverfront make for an enjoyable art tour. 20. 6th St. Murals (Back of 535 Madison Ave. and 601 Madison Ave.) Standing on 6th St. and Madison Ave., you are just half a block away from 3 world-class murals. Turn west onto 6th St. and walk to the Firestone building. Turn around and face Madison Ave. 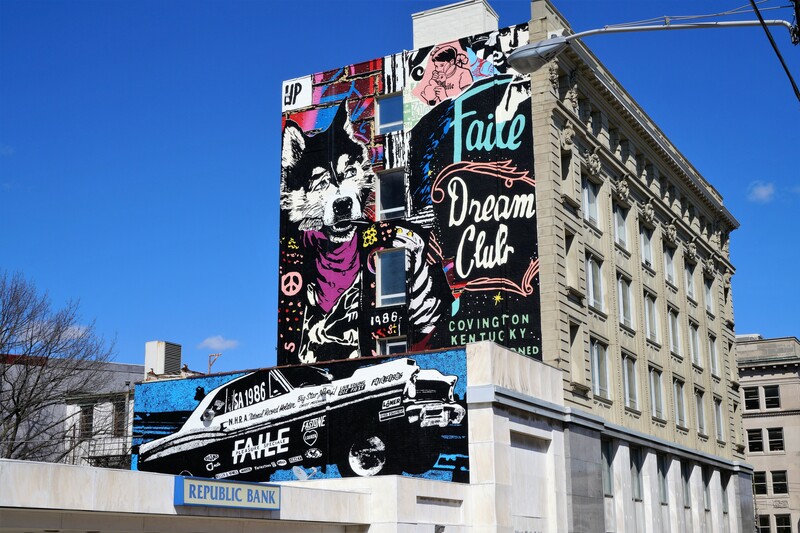 The murals, created by internationally-renowned artist collective known as FAILE, are installed on the Republic Bank and Donna Salyer’s Fabulous Bridal buildings. 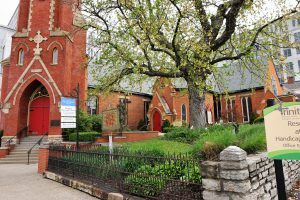 Brought to the area by BLDG, these artists join other muralists, sculptures and others who are helping cement Covington’s growing reputation as a center for public art. Read more about the FAILE murals here. 21. 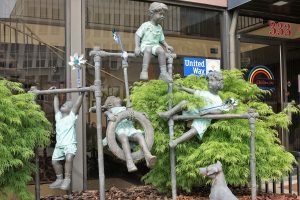 Children, Inc. Statues ( 333 Madison Ave.) This collection is installed in front of the main office of Children, Inc., a childcare and early learning services agency. The statues of playing children charm passers-by. 22. Cov 200 Mural (5th & Madison Ave.) Designed by BLDG, this is one of several murals in town that celebrate Covington’s 200th birthday, which was in 2015. 23. 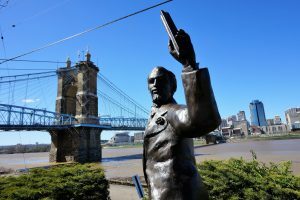 John A. Roebling Statue (Riverside Dr. & Greenup St.) Entering the riverfront from the end of Greenup Street, you will see a statue of John Roebling, the architect of the John A. Roebling Suspension Bridge. 24. 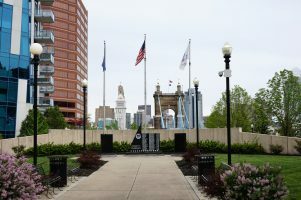 Police Memorial (1 Roebling Way) This memorial is dedicated to the fallen police officers of Northern Kentucky. Each May, the Northern Kentucky Police Chiefs Association holds a memorial service to honor these officers. 25. Roebling Floodwall Murals (from Madison Ave. to foot of Roebling Bridge) Walking west along the river from Roebling Bridge, you will see the floodwall that was constructed in the aftermath of the Ohio River Flood of 1937, which damaged areas from Pittsburgh, PA to Cairo, IL. 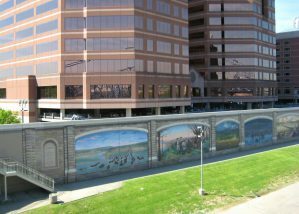 The murals were begun in 2002 by a team of artists led by Robert Dafford. The 18 panels depict scenes from Covington’s history. You can read the details about each mural here and listen to cov200tour.com’s audio tour here. Architecture and History Starting with the Roebling Bridge, the Ascent (which is on this tour, go here for more details) and Trinity Church, there are many examples of beautiful structures. 9. 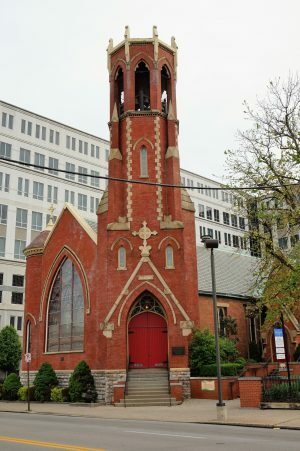 Trinity Church (16 E. 4th St.) Located on the corner of Madison and 4th St, is Trinity Episcopal Church. It was built in the Gothic Revival style and completed in 1859. There is a charming garden that you can enter from Madison Ave., through the wrought iron gate. A redesign beginning later this year will include a fountain and new plantings. The design drawings will be available for you to see on the Beyond the Curb tour day. 4. Trinity Church Garden (16 E. 4th St.) Enter the garden through the wrought iron gate. Drawings of the upcoming redesign will be on display during the tour. Restaurants Click on the names below for more information.